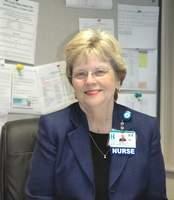 Fran Needham, MS, RN, a Director of Nursing at Beebe Medical Center, has been honored with the You Make a Difference Award for December 2011. In her role, Needham is responsible for patient care in the areas of Emergency Services, on the hospital's medical-surgical and orthopaedic units, and nurse staffing. She has become known for going above and beyond to provide support and guidance to Beebe's team of nurses, any time of the day or night. It is not unusual for her to respond quickly to calls from the hospital late at night or during the early morning hours. Nursing staff members have found it easy to talk to her about their frustrations or concerns. Nurses have said that they look to Needham for inspiration, even asking themselves, What would Fran do? when addressing complex issues. Needham shows her commitment to ensuring the best of care to our patients through her excellent supervision and to the positive reinforcement she gives her staff. Needham is an outstanding role model and leader at Beebe Medical Center.